Sometime in the next few days, the decision in the Supreme Court case Janus vs. AFSCME will shape the future of public sector unions by determining if agency fees are legal. This is a big deal, especially for teachers’ unions. They stand to lose loads of money if the Supreme Court rules in favor of Janus. Earlier this month, we released a slide deck report to inform the ongoing conversations about Janus and its outcome. 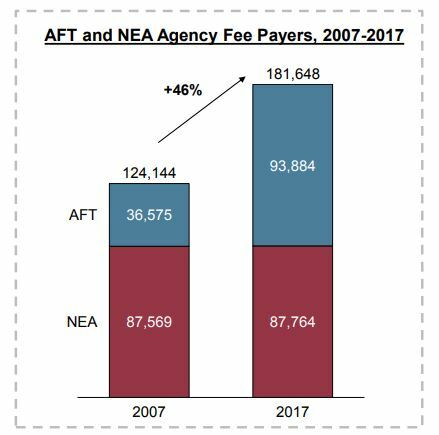 Here are seven key facts from “Overview of the History and Status of Teachers’ Unions“ to help you understand union membership trends, teachers’ unions specifically, and the meaning of those pesky agency fees. Union membership peaked in the mid-1950s when 35 percent of wage and salary workers were in a union compared to only 11 percent today. Click to enlarge. “Overview of the History and Status of Teachers’ Unions,” slide 12. 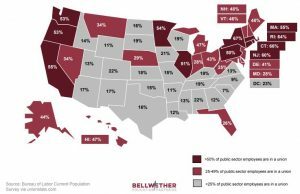 In 26 states, more than one-quarter of public sector employees are in a union. In 11 states, more than half are. The American Federation of Teachers and the National Education Association are the nation’s two largest teachers’ unions. Between 2007 and 2017, an increasing number of people represented by these unions have opted to pay agency fees that support the union in collective bargaining instead of becoming a member and paying full dues that support other activities of the union like political lobbying. Teachers in Colorado, Arizona, West Virginia, North Carolina, Kentucky, and Oklahoma recently banded together in statewide strikes. In many cases, these strikes energized teachers and communities and showed the power of collective action. 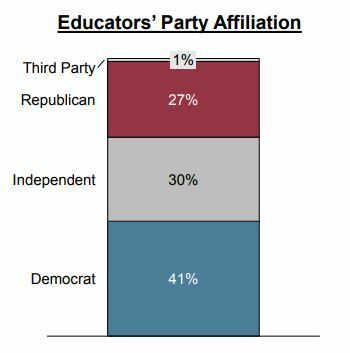 Actually, fewer than half of educators who responded to an Education Week poll identified as Democrats. 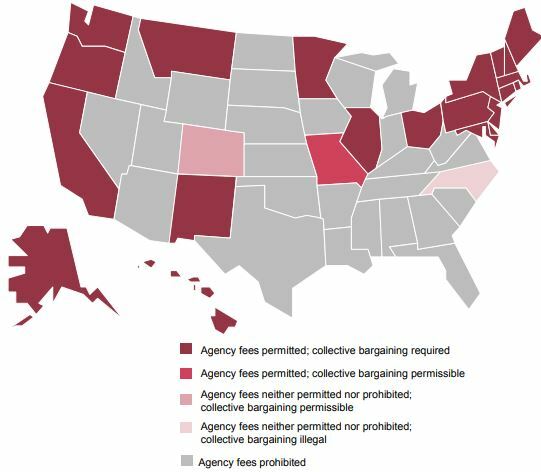 Teachers’ unions will likely lose the most revenue from the 21 states and D.C. where agency fees are currently permitted and collective bargaining is required. But teachers’ unions aren’t going down without a fight. In advance of the Supreme Court decision, they’re re-engaging current members and educating them on the benefits of membership and the potential negative effects of Janus, hosting local and statewide summits, and identifying ways to expand services to retain members. If you’re interested in learning more about the history of unions and the implications of the Janus decision, check out our full deck here. This entry was posted in Education Policy, Politics of Education and tagged agency fees, Janus, Janus vs. AFSCME, Mark Janus, Supreme Court, teachers unions on June 13, 2018 by Kaitlin Pennington.